Hereditary hair loss is one of the most common problems for both men and women. It is a natural problem which is caused by different factors such as genetics, hormone levels, and the aging process. The problem of hair loss usually begins in the 20s or 30s. The hair loss problem in women is called androgenetic alopecia and for men, it is called male-pattern baldness. The issue can be solved if the patient starts the treatment at an early stage. The problem of hair loss starts in men at the age of 30 or after the puberty. The problem is also called male pattern baldness. It is hereditary and is also dependent on the change in hormone levels.Hereditary hair loss issue in men is around 90%. It is not necessary that the problem of hair loss in women occurs after the menopause (the end of women’s fertility). The problem is also called female pattern baldness. The thinning of the hairs occurs on the top of the head. The problem is common after the age of 30 and becomes more noticeable after the age of 40. 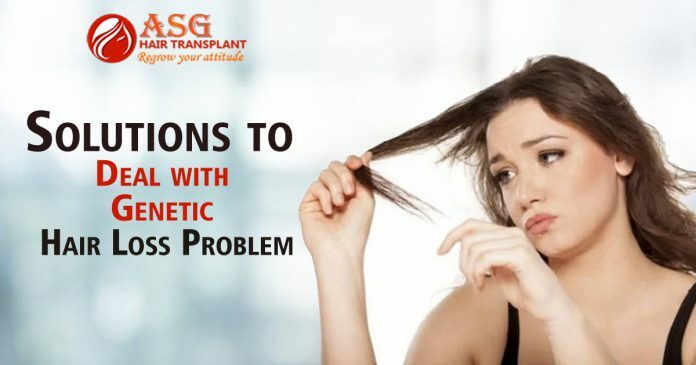 How to deal with the problem of genetic hair loss? Finasteride (Propecia): It is the only pill that blocks the formation of testosterone that affects the hair growth. The hair follicles are not affected in this process. The medication is common for male-pattern baldness. The results are shown after 4 months of medication. Minoxidil topical lotion: It is basically a rub-on treatment. It is easily available on any pharmacy. The lotion can be used by both male and female. When your hairs are dry, then you should apply the lotion. Apply the lotion twice a day to get the best results. The results are best on the top and back of the scalp. You should apply the recommended dose. The treatment will take around 4 months to show any results. A side effect which is common in this treatment is an itchy scalp. Diet is important: Your hairs also need food which is available in the form of proteins. You should include the proper amount of nutrients in your diet to stop hair fall. You should eat chicken, egg, nuts, grains, dried beans, and cheese. Hair Transplant: In this treatment, hair grafts are removed from good area in head and then grafts are placed where hair growth is low. Next articleIs Cleansing Conditioner Also A Reason of My Hair loss?